The international Catholic pastoral charity and pontifical foundation Aid to the Church in Need (ACN) has launched a Christmas campaign of prayer, aid and solidarity for the people of Syria, entitled Candles for Peace in Syria. The campaign formally began on the first Sunday of Advent, 2nd December, with the symbolic lighting of a candle by the Holy Father at the end of the Angelus prayer. Image: Many schoolchildren from Damascus, Homs, Aleppo, Tartus and many other places have drawn and wrote messages for peace on candle cardboard candle shields. Copyright Aid to the Church in Need. In the last few days the initiative has involved over 50,000 children, of different religions, from several of the Syrian cities most severely affected by the war, including Aleppo, Damascus, Homs, Marmarita, Hassaké, Tartus and Latakia. The children have prayed and decorated candles with symbols of peace– crosses, doves and messages of hope – to convey to the world their longing for peace. For all too often the prime victims of the conflict, which is still ongoing, have been these little Syrian children. ACN International is calling on people of goodwill all over the world to respond to this cry of peace from the children of Syria, among other things by lighting a candle, as the Holy Father will do on Sunday, in order to amplify the resonance of this clarion call for peace from the children of Syria and send out a strong message of hope during the season of Advent. The candle which the Holy Father lit was decorated by a local craftsman from the Bab Touma quarter of the Old City of Damascus and also bears the photos of some 40 children, most of them from Aleppo, together with the logo of the campaign – a dove with outstretched wings in the shape of a child’s hand and the message “Peace for the Children of Syria 2018” – plus the logo of ACN International. This is not the first time that ACN has spoken out for the children of Syria. 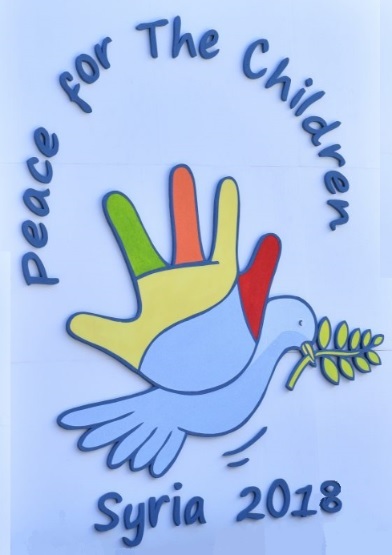 Back in 2016 the charity made an appeal to the European Parliament, conveying to it pictures drawn by the children, expressing their longing for peace. In response to the critical humanitarian situation in Syria and in order to prevent the disappearance of the Christian presence in the country, ACN is accompanying its Candles for Peace initiative with an international fundraising campaign over Advent and Christmas, organised through its 23 national fundraising offices. The campaign envisages a package of emergency aid, reconstruction aid and pastoral support for a total of AUD $23,062,350. This comes on top of the AUD $45,143,040 already donated by the charity since the beginning of the conflict in 2011. The ambitious programme involves the distribution of food parcels and other basic essentials, including medicines, milk powder for babies, support with rent and heating costs for the refugees, rebuilding of the homes of the Christian refugee families as well as their churches and religious houses, support for the priests and religious who are ministering to them, spiritual and psychological support for the traumatised, help with school and education fees for school children and young students and, last but not least, simple Christmas parcels for over 15,000 of the poorest and most destitute children.